If you know me and my dining patterns, you kind of knew that Tinderbox Kitchen had to be my first post. It's my place "where everybody knows my name," and they pretty much know what I drink, too. 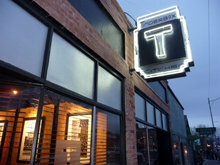 "TBox," as it's known to its fans, is co-owned by Chef Scott Heinonen and manager Kevin Heinonen. I met Scott when he was the chef at another downtown restaurant, and he won me over by making chicken liver pate. Really. Right before TBox opened in 2009, I remember Scott calling me to say, "I'm opening up a new place, and I hope you'll try it." I've pretty much been at the restaurant at least once a month ever since. There are any number of preparations for this, and whatever is the selected way that night is going to be good. If there's creamed corn with bacon on the menu, get it. Also, the scallops regardless of preparation are always big and tender, never overcooked.